Derry Director of Football, Brian McIver has announced plans for a two-day workshop aimed at providing Derry’s clubs with information and advice ahead of the pre-season for 2016. With club managers, coaches, trainers and youth officers all invited to attend the events to be held on 9th and 16th of January at Owenbeg, McIver hopes that it will be a valuable start to the new year. “This is about providing the best level of service that we can to clubs. 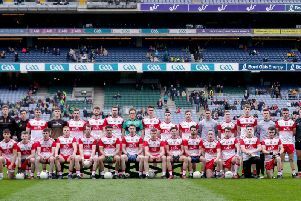 It’s important to realise that this is a collective effort,” explained the former Derry senior manager. “Ben McGuckin will focus on another important area of modern preparation, that of Performance Analysis through the use of stats, video analysis and other technologies,” he explained. The planned workshops will also see widely respected nutritionist, Sharon Madigan, address club coaches on the important role of lifestyle and diet, whilst local physio, Ann Boylan in combination with Eoin Bradley, will address the vital area of injury prevention. With concussion a hot topic throughout the last number of years, Derry hurler and coach, Ruairi Convery, will inform those present of the implications of guidelines and best practice for suspected cases. Damian Barton and Brian McGuckin will outline the county’s senior team plans for the season ahead whilst Philip Kerr and Danny Quinn will introduce the aims of the newly established Academy, designed to develop players in the important post-minor years, and will outline the benefits of the new plan to clubs. 3:30pm – 4:00pm: County Senior Team Schedule, Programme and Information for Clubs – Damian Barton and Brian McGuckin. Attendance is free-of-charge to all those working with Derry clubs. Prospective attendees are asked to get in touch with Ashleen McCaul (email: ashleen.mccaul.gda.derry@gaa.ie) by Monday, January, 4th in order to confirm their place and gauge overall numbers.